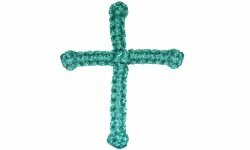 Description: This Cross Design is an easy Macrame project suitable for school age children and beginners. Young children may need a little help to create this Macrame cross. You can use any type of material to make this cross decoration, but I recommend braided cord, so the knots are more sturdy. In the example shown, I used 4mm polypropylene, which is similar to nylon. 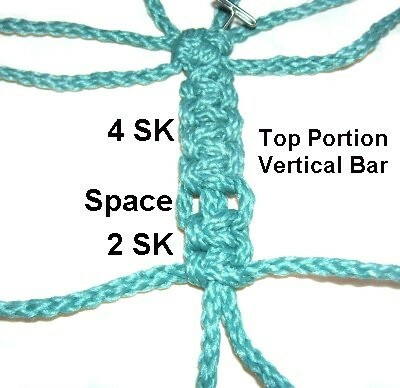 You can change this basic design by using other decorative knots. Any knot that can be tied with 4 cords, arranged in a chain is suitable. See Learn Macrame for ideas. On the ends, there are button knots. This finishing technique can be modified as well. Prepare the ends carefully, wrapping small pieces of tape around the tips of the cords. Step 1: Find the center of the four 36-inch cords. Secure them to the project board so they cross, forming an X shape as shown. Mentally label the 4 segments A - D. The two cords in each area act together. Step 2: To make the Crown knot in the center of the Cross Design, you fold or curve the cords in each area over those in the next area, moving counter-clockwise. The images below show more details. << Move segment A to the right over segment B. Be careful not to disturb the segment A cords. << Move segment C to the left over segment D.
Pull all 4 segments to tighten the Crown knot. Step 3: Arrange the cords as shown, with 2 cords in 4 areas. The cords in each area should come from different segments (see details below). Each of the four areas of the Cross Design are formed by Square Knots (SK). The images below show the 4 steps to tying them. Step 4: The first SK you tie will be when you add a new cord to two of the ones you have been working with, which will act as fillers. To add a cord, place a new 60-inch cord under one cord in use, and match the ends so each half is the same size. Then you use the new cord to tie the knot, around the fillers. << Move the left half of the new cord to the right, passing over the fillers and under the right half. Pull both ends to tighten the first half of the SK. 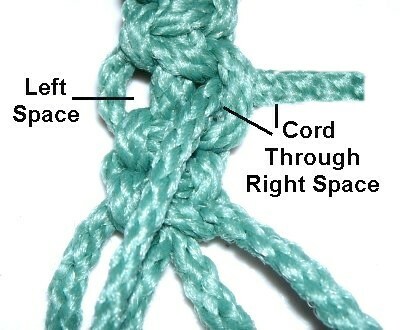 Slide up the knot so it rests against the Crown knot. The two ends are now switched, so the left half is on the right, and the right half is on the left. << Move the left half to the left, passing over the fillers and under the right half. Step 5: The upper and lower vertical bar and the arms of the Cross Design have a specific number of Square Knots, followed by a 1/4-inch space. You can change the number of knots if you wish. 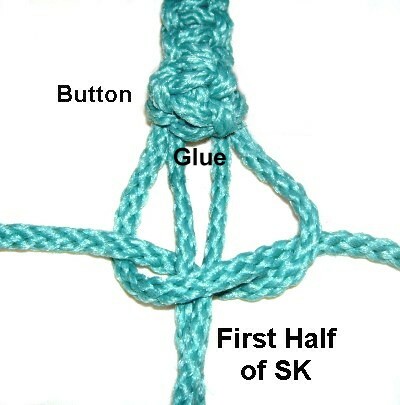 Two more SK are tied below the space, for the button knot. Finish the cords in some other manner, if you decide to not to tie the button. 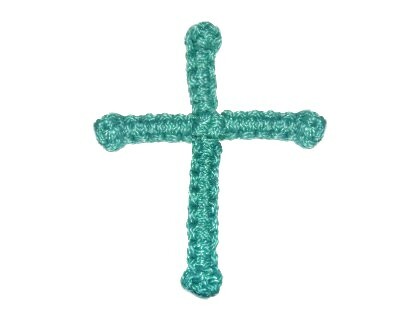 Step 6: Complete each of the 4 parts of the cross, with the number of knots listed above. 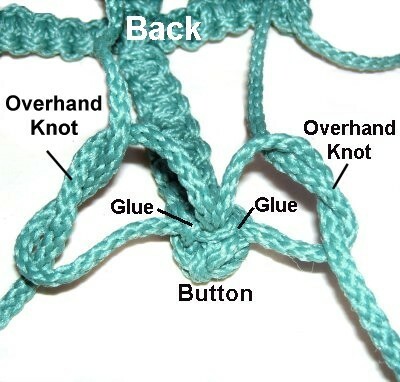 Make sure each knot is firmly tightened, and push them close together if there are any gaps. Pass the ends through the 1/4-inch space, which has two parts, to the right and left of the fillers. The two cords on the right should go through the space on the right, and the other two on the left. Step 8: Pull all 4 cords down firmly, so the two SK roll into the button shape. Organize the four cords. 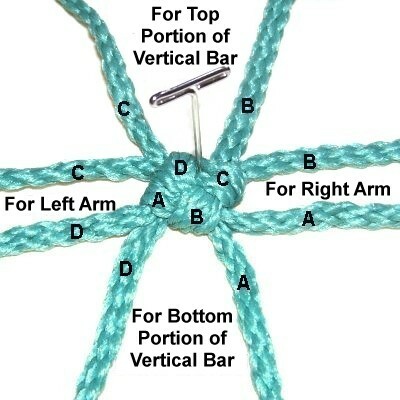 As you tighten, apply glue next to the button, so the Square knot will be on top of it. Step 9: Flip the Cross Design over, so you are working at the back. Tie a very tight Overhand knot with two cords, applying glue just before tightening, so it will be inside the knot. Do the same with the other cords. When the glue is dry, cut off the excess material. Have any comments about the Cross Design? Contact Me.